At the Cardiology Center, we are dedicated to providing the highest level of professional integrity and excellence in caring for patients with known or suspected heart disease, with the goal of optimizing cardiac health and well-being. All of our cardiologists are board certified in adult cardiology, and have trained in some of the most respected institutions in the country. 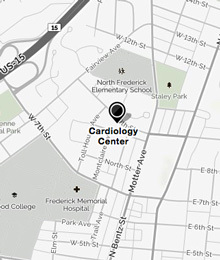 We have admitting privileges at Frederick Memorial Hospital, and work with leading cardiologists and surgeons at Maryland/DC tertiary and academic hospitals, in the event that our patients require additional evaluation and treatment. Office hours at the Cardiology Center are weekdays from 8:30 a.m. to 5 p.m., holidays excepted. Earlier appointments are available for some diagnostic tests, and expeditious scheduling is usually possible, when medically necessary. Kindly call in advance to arrange an appointment. Please bring a list of your current medications with dosages, pertinent medical records, your insurance information, and a referral from your primary care provider (if required by your insurance company) to each appointment. Please do not put any oils or lotions on your chest. We request the courtesy of at least 24 hours’ notice if you are unable to make your appointment so that we can offer this time to another patient. This is especially important for diagnostic tests. If you have a life-threatening emergency, please call 911 and go immediately to the emergency department of the nearest hospital. If you are an established Cardiology Center patient with an urgent question not related to a life-threatening emergency, please call our office for instructions on how to contact the cardiologist on call. In the event that emergency services are required, one of our cardiologists is always available while the office is closed. All of your interactions with us are maintained in the strictest confidence. Cardiology Center is compliant with the Health Insurance Portability and Accountability Act (HIPAA). Copies of our notice of privacy practices are available in our office. Take the 7th Street Exit. Turn left (east) off the exit ramp onto 7th Street. Go approximately 0.3 mile and turn left at the light onto Toll House Avenue (Frederick Memorial Hospital will be on your right). Turn right at end of Toll House Avenue onto 9th Street. Turn right at the first driveway into the Ninth Street Medical Building. Cardiology Center is in Building A, which will be on your right. 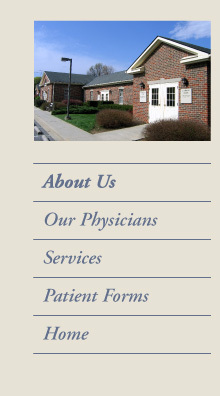 Our address is 310 West 9th Street, Frederick, Maryland 21701.